How To Guides – "Expertise, Right Across the Board"
What is UL and how does it relate to conformal coating? UL stands for Underwriter Laboratories. They are a global safety certification body for consumer electronics. When a conformal coating states that it has a UL qualification, it means that the material has been independently tested by UL in one of their laboratories and passed a particular standard. UL carry out the testing. It is independent. There is no self-certification available. UL qualified conformal coatings are used in all areas of electronics protection including aerospace, industrial controls, automotive and telecommunication sectors. What UL standard tests are used with conformal coating? 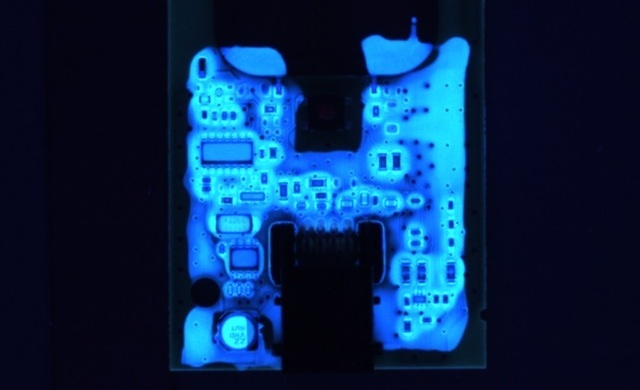 For conformal coating materials there are two standard tests typically used. These are UL94 and UL 746E. UL 94 Standard for Safety of Flammability of Plastic Materials for Parts in Devices and Appliances testing. UL 94 is a plastic material flammability standard. It classifies plastics according to how they burn in various orientations and thicknesses. UL 94 measures a conformal coating material’s ability to extinguish or to spread the flame once a test specimen has been ignited. This ability is ranked as a classification as below. For conformal coatings the coupons are normally tested Horizontally (HB). Tests are normally conducted on coupons of the minimum approved thickness with different types of laminate. The conformal coating thickness range also is normally specified. Most conformal coatings aim to achieve V-0 status. The UL 746 test measures the resistance of the conformal coating to electrical ignition sources. Click UL standards and conformal coating for further information on whether you need UL qualified conformal coatings or contact us directly and we can help you. Author nexus3cPosted on June 27, 2017 June 27, 2017 Categories Blogs, How To Guides, UncategorizedTags Coatings, coatingstandards, conformal coating, MiLSpec, nexus, Nexus3cLeave a comment on Do you need UL qualification for your conformal coating? The application of a conformal coating using a brush to “paint” on the material to the circuit board is a common practice all over the world. Generally, it is done as a final touch up process after the main application method is used. However, it can also be done in mainstream production. The operator according to the requirements of the circuit board applies the conformal coating selectively with the brush. Areas not be coated are avoided. The key for success with brushing conformal coating is the technique of application. The correct method is to flow the coating on. The coating should be loaded on to the brush and flowed onto the circuit. The material should not be brushed on like paint. Watch a video on brushing conformal coating. Click conformal coating brushing for further information or contact us directly and we can help you. Author nexus3cPosted on May 2, 2017 Categories Ask The Experts, conformalcoating101, How To GuidesTags brush application, conformal coating, conformalcoating101, nexusLeave a comment on How do I brush coat my conformal coating? Conformal coatings can be applied to printed circuit boards (PCBs) in the production process environment in many different ways. Click on each to review each conformal coating application technique in our free ebook online. 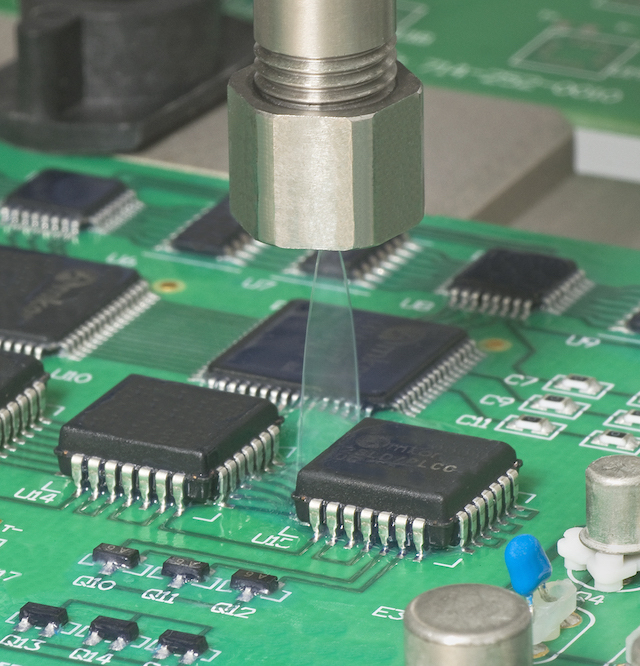 Conformal coatings can be applied to printed circuit boards (PCBs) in the production process environment in many different ways including spraying selectively, batch spraying and dipping. Each of the various coating methods has different advantages and disadvantages. This relates to the holistic approach to conformal coating processing. It states that you should consider the conformal coating material itself, the application process and the circuit board together and not as three separate entities. However, when considering the application methods it is possible to make some assumptions that help in selection. 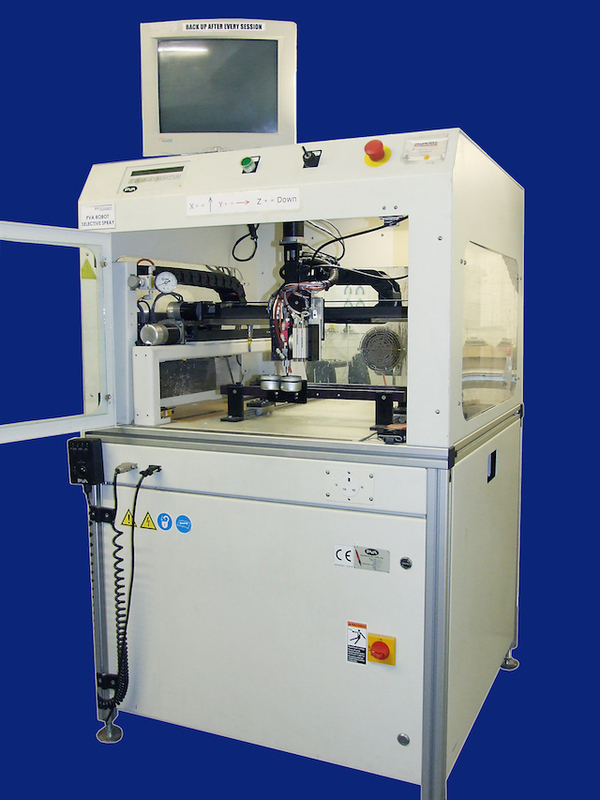 For further information on conformal coating application methods then contact us directly and we can help you. Author nexus3cPosted on April 18, 2017 Categories Ask The Experts, Blogs, How To Guides, UncategorizedTags aerosol spray, application methods, batch spray, brushing, circuit boards, Coatings, conformal coatings, dipping, nexus, pcb, selective spray, vappour depositionLeave a comment on What application methods are available for applying conformal coating? Water repelling (hydrophobic) Properties – An ultra-thin coating is normally hydrophobic. This is because it is normally a fluoropolymer technology. The coating does not allow the water to wet on the on the surface of the coating. It modifies the surface and changes its dyne energy. A typical conformal coating like an acrylic or polyurethane is not water repellent and water wets the surface. Ultra-thin –Typical coating thickness is 1-2um for a coating (depending on application) compared to the acrylic, urethane and silicone conformal coatings that are applied at >25um. No masking of connectors required – The circuit board can be completely submerged in the coating liquid with no masking applied. Due to the extremely thin coating applied (<1-2um), the components can be connected together and the electrical connection is easily made. This would not be possible for a standard conformal coating. So, costs of processing are extremely low. Simple application process – The ultra-thin coating can be applied by dip, brush or spray. But, the simplest method is dipping. Since there is no masking then the dip process is simple and is an extremely cost effective application method. Fast drying – Since the coating is ultra-thin and the solvents normally used are fast drying then the fluoropolymer coating dries extremely quickly. The coating can be dry in seconds and ready for use in a few minutes. For further information on the ultra-thin, nano- coatings then contact us directly. Or, you can go to our free eBook by clicking fluoropolymer coating materials now.